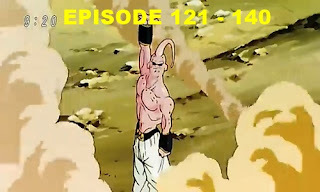 Eps 121 - Secret Plan to Defeat Buu, Its Name is Fusion! Eps 122 - A Faint Hope in Sight! The Warriors Wake Up!! Eps 123 - Find the Nuisances, Babidi's Revenge Plan Begins!! Eps 124 - The Time of Ordeal, Attain the Legendary Power! 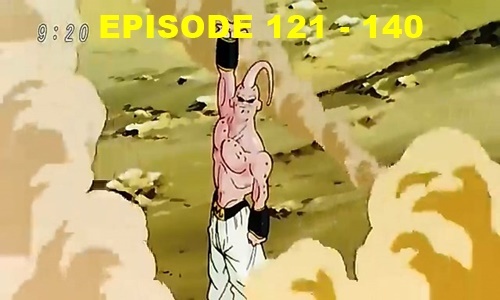 Eps 125 - Delay Majin Buu, The Limit! Super Saiyan 3!! Eps 126 - Standing Up For Himself, Buu's Rebellion! Eps 127 - Awful Looking!? Special Training, Fusion Pose! Eps 129 - Found You, Gohan! Harsh Training in the Realm of the Kais! Eps 130 - Birth! Combine Super Warrior, His Name is Gotenks!! Eps 131 - Who Will Be the One to Defeat the Majin? The Beginning of the Strongest Man!! Eps 132 - The Power-Up Continues!? Perfected! Super Gotenks! Eps 133 - Born From Anger - Another Majin! Eps 134 - Buu Eats Buu - A New Majin Attacks!! Eps 135 - Head Straight towards the Catastrophe! One Hour Time Limit!! Eps 136 - Special Training Completed! You’re Finished Now, Majin Buu!! Eps 137 - Buu Eliminated With Ghosts! A Surefire Kamikaze Attack!! Eps 138 - The Reserved Transformation of Gotenks! Super Gotenks 3!! Eps 139 - In High Spirits! Buu-Buu Volleyball! Eps 140 - You Kept Everyone Waiting! A Reborn Gohan Returns to Earth! !